Michael has continued to strengthen across the Gulf of Mexico overnight, becoming a dangerous Category 4 hurricane with winds of 145 mph. Rain bands and gusty winds are already being felt ahead of the landfall across the Florida Panhandle, with recent gusts of 56 mph in Apalachicola and 43 mph in Panama City. Not much has changed in the expected path – or overall impacts – from Michael. This system will make landfall later today around midday along the Florida Panhandle as a major hurricane with destructive winds, heavy rain, and life-threatening storm surge. Michael is expected to strengthen a little more before landfall occurs. If the forecast holds, this will be the first hurricane of Category 4+ strength to make landfall along the Florida Panhandle in recorded history. The entire Florida Gulf Coast north of Punta Gorda has never had a Category 4 or higher storm make landfall. 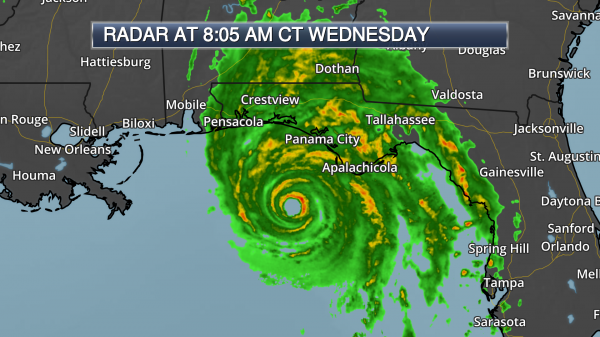 The strongest winds of 100+ mph are expected near the coast in the Panama City and Apalachicola areas as Michael approaches and makes landfall later today. These winds will cause power outages as well as structural and tree damage. Strong wind gusts will start to decrease the further inland you go, but wind gusts of at least 30 mph are expected along the path of Michael into the Mid-Atlantic tomorrow. Water levels are already rising along the Florida coast this morning. A dangerous, life-threatening storm surge is expected along the Florida coast as Michael approaches. 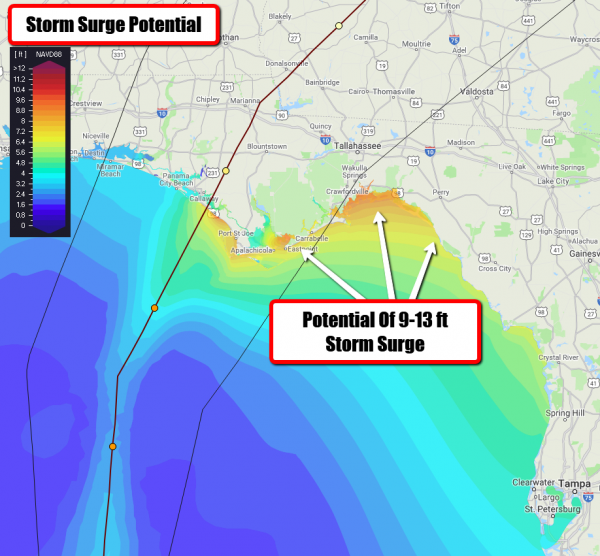 The worst storm surge flooding will occur along the immediate coastline near and east of where the center makes landfall with the National Hurricane Center expecting a storm surge of 9-13 feet from Tyndall Air Force Base to Keaton Beach, including Apalachee Bay south of Tallahassee. A wide swath of 4-10” of rain is possible from the Florida Panhandle to southeastern Virginia in association with Michael. 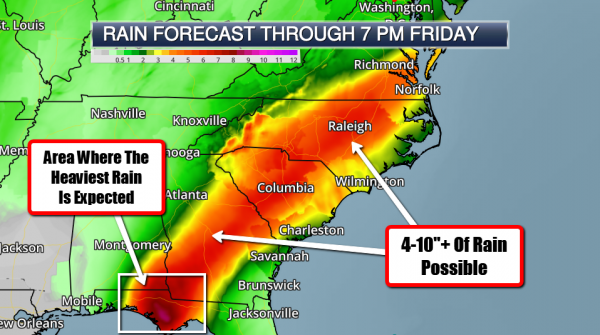 The heaviest rain amounts – where isolated 12” amounts could occur – will be across parts of the Florida Panhandle, southeast Alabama, and southwest Georgia. This rain could lead to life-threatening flash flooding across the region. Flash Flood Watches are in effect. Michael On Satellite. 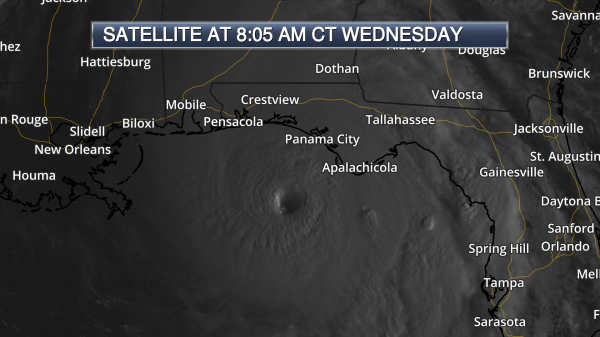 Dangerous Hurricane Michael is looking impressive on satellite this morning, with an eye that is about 23 miles in diameter. Michael has continued to strengthen as well, containing sustained winds of 145 mph as of 8 AM CT. As of that time, the center of Michael was about 80 miles south-southwest of Panama City, FL, or about 85 miles west-southwest of Apalachicola, FL, and moving to the north at 10 mph. Michael Sitting Just Offshore. 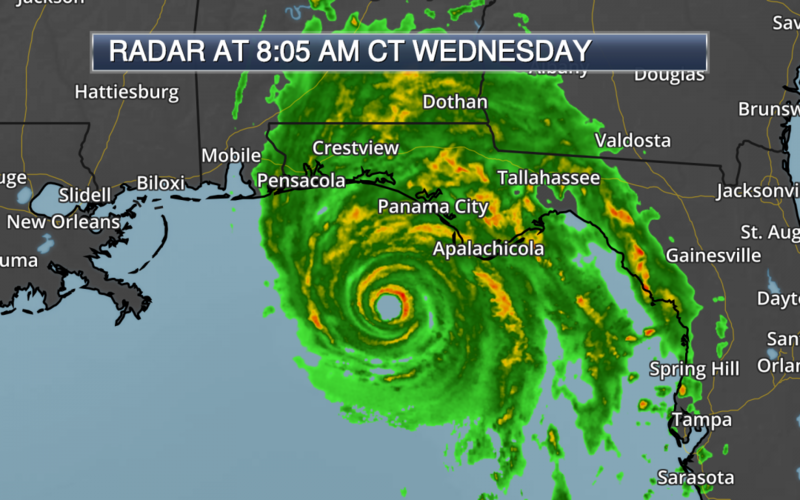 You can see the eye – and the entire system – approaching the Florida Panhandle on radar as well. Outer rain bands have started to impact the region this morning with occasionally heavy rain and gusty winds. 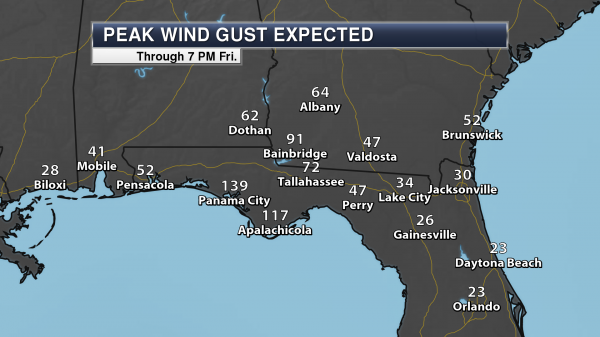 Already wind gusts of 56 mph in Apalachicola and 43 mph in Panama City have been reported since midnight. Water Levels Already Rising Along The Florida Coast. As Michael pushes closer to land, water levels are quickly rising across the coast of the Florida Panhandle. 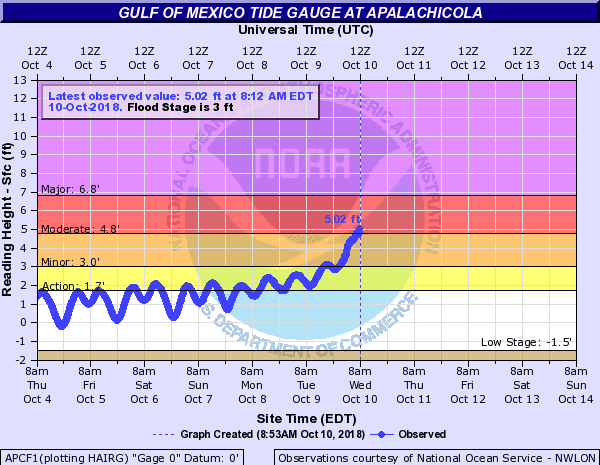 The Gulf of Mexico Tide Gauge at Apalachicola already shows water levels at around 5 feet this morning – in moderate flood stage. 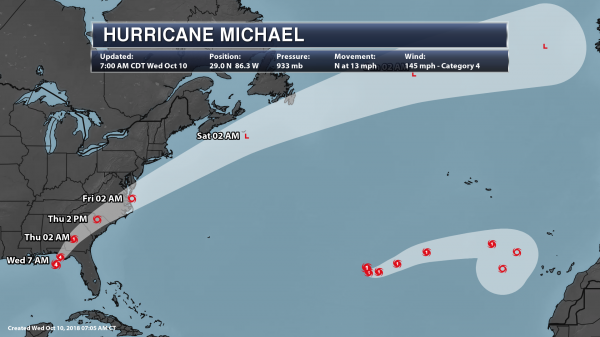 Close Up Track Of Michael. Michael will make landfall along the Florida Panhandle (somewhere near Panama City) during the midday hours today as a very powerful Category 4 hurricane. A turn to the northeast is expected today and that motion will continue into Thursday, which will bring a weaker system into central Georgia by early Thursday morning. Zoomed Out Michael Track. Michael will then continue to weaken as it moves over parts of the Southeast and Mid-Atlantic Thursday, positioning itself just off the North Carolina/Virginia shoreline early Friday morning. While it will strengthen after that time, it will also be over the open waters of the Atlantic, passing south of Nova Scotia Friday Night into Saturday. Hurricane Warnings are in effect for Pensacola, Panama City, Apalachicola, and Tallahassee (FL), Dothan (AL), and Bainbridge, Albany, Moultrie, and Tifton (GA). 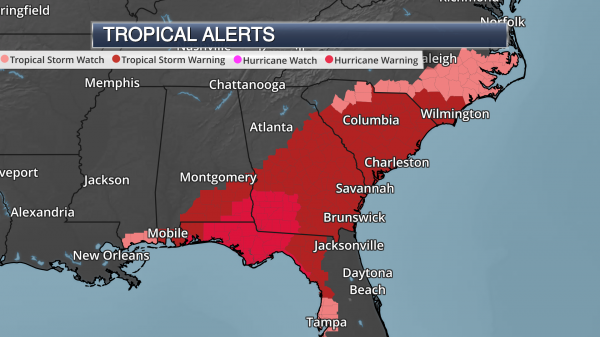 Tropical Storm Warnings are in effect for Mobile and Troy (AL), Macon, Dublin, Augusta, and Savannah (GA), Columbia, Charleston, Myrtle Beach, and Florence (SC), as well as Wilmington and Lumberton (NC). Tropical Storm Watches are in effect for Gulfport and Biloxi (MS), Tampa (FL), Rock Hill (SC), Fayetteville, Greenville, Jacksonville and Hatteras (NC). Destructive Winds Likely. 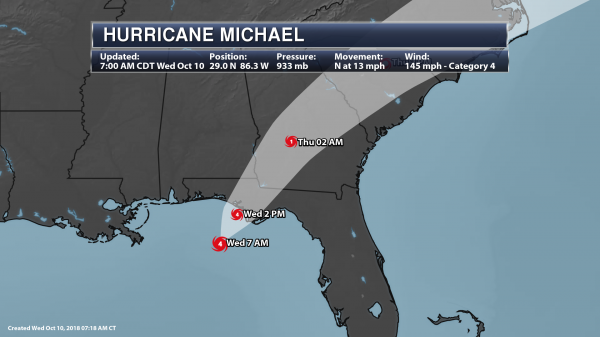 The strongest winds are expected near the coast as Michael approaches and makes landfall later today, with wind gusts over 100 mph expected for areas like Apalachicola and Panama City. These winds will cause power outages as well as structural and tree damage. Wind gusts start to decrease below hurricane force the further you head inland, with Albany, GA, expected to see a peak gust of 64 mph. Strong Winds Expected Along The Track. Even though Michael will weaken as the system moves inland across the Southeast and Mid-Atlantic, strong winds gusts of at least 30 mph will be possible from Georgia to coastal North Carolina. This is the reason that Tropical Storm Watches and Warnings extend all the way to the Mid-Atlantic. The stronger wind gusts would be capable of power outages and fallen trees, especially due to the already saturated soils across parts of the Mid-Atlantic. 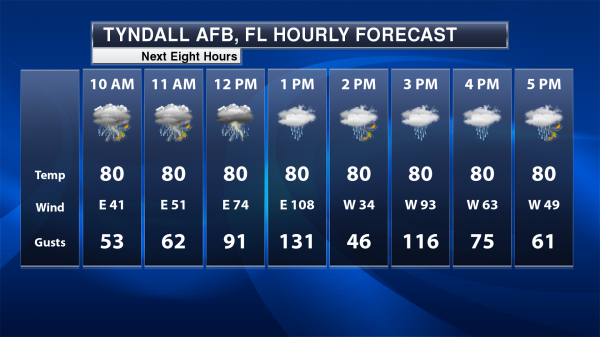 Timing Out The Winds – Tyndall Air Force Base. Some of the strongest wind gusts are expected in the Panama City area during the early and mid-afternoon hours, with wind gusts over 130 mph at times. The dip you see in the 2 PM hour would be the eye passing over the region, with winds picking back up on the other side of the eyewall. Storm Surge Alerts. 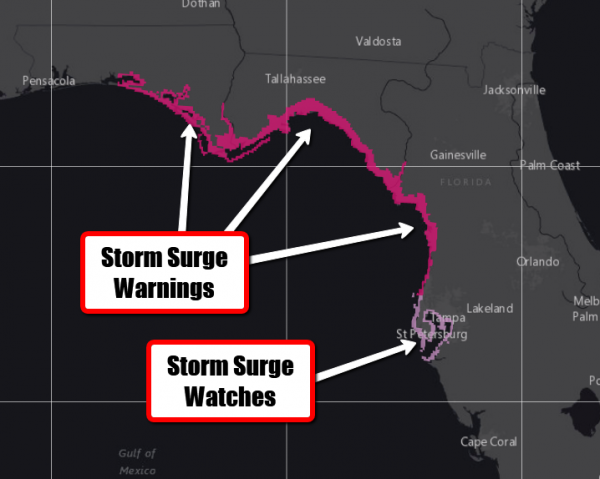 Due to the potential of storm surge flooding with Michael, Storm Surge Warnings are in effect from Okaloosa/Walton County Line to Anclote River, and Storm Surge Watches are in effect from Anclote River to Anna Maria Island, including Tampa Bay. Heavy Rain Potential. Heavy rain will also fall as Michael approaches and moves across the Southeast and Mid-Atlantic over the next couple of days. A wide swath of 4-10” of rain is possible from the Florida Panhandle to southeastern Virginia in association with Michael. 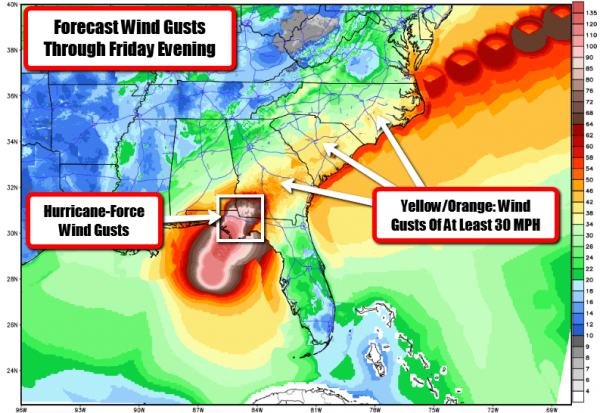 The heaviest rain amounts – where isolated 12” amounts could occur – will be across parts of the Florida Panhandle, southeast Alabama, and southwest Georgia. This rain could lead to life-threatening flash flooding across the region. Flash Flood Watches. 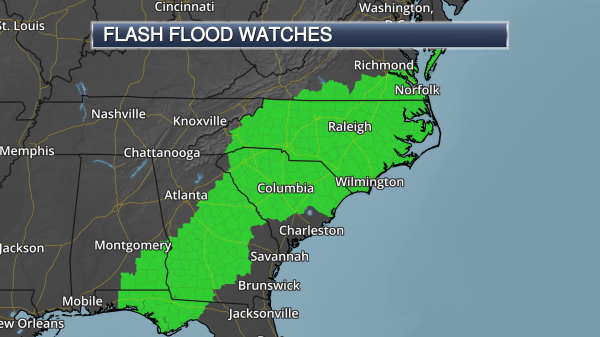 With the heavy rain potential, Flash Flood Watches are in effect from Florida into southeast Maryland. These watches include cities like Tallahassee and Panama City (FL), Dothan and Enterprise (AL), Albany, Macon, Augusta, and Athens (GA), Columbia, Greenville and Florence (SC), Charlotte, Raleigh, and Wilmington (NC), as well as Norfolk and Danville (VA). Tornado Watch Until 5 PM ET. Landfalling tropical systems also pose the potential of producing tornadoes. 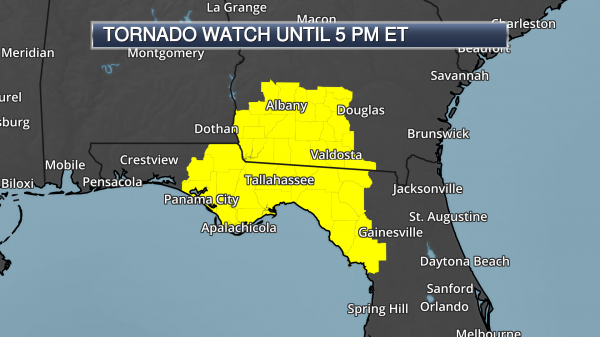 Due to the potential of a few tornadoes today, a Tornado Watch has been issued for parts of Florida and Georgia (including the cities of Tallahassee and Panama City (FL) as well as Albany and Valdosta (GA)) until 5 PM ET.